When I was a local TV news producer, I – systematically and with relish – pretty much deleted every single PR-pitch email that I ever received. Why? For one, I was pretty young and arrogant, believing I didn’t need any help from PR pros (insert my eye roll here) to come up with a story. But secondly, and I think more telling, is that PR people just have a bad reputation. Years of bad practices, including irrelevant pitches, calling at inopportune times, pushy pitches, have unfortunately given the industry a bad rap. I really thought PR people (I lumped them all together) had nothing really of value to offer me. With all of that being said, I find it extremely ironic that my CMI role now puts me on the other side as the one pitching our ideas to journalists and bloggers. 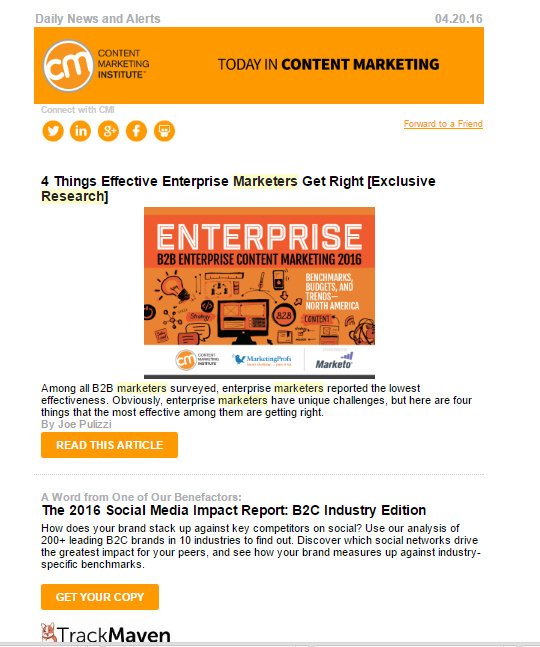 CMI probably gets cited in as many as a dozen blogs, articles, videos, or podcasts a day. 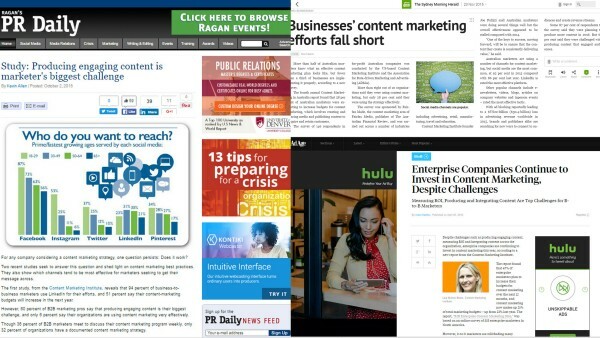 While the coverage spans everything we do, most of it references our original content marketing research, particularly the B2B research that we publish each fall. 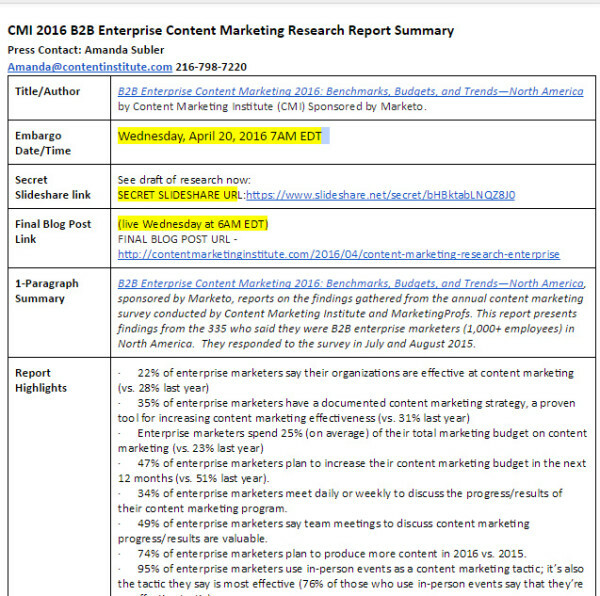 Since B2B Content Marketing: 2016 Benchmarks, Budgets and Trends – North America came out in September, I’ve tracked hundreds of mentions of it, and the coverage increases significantly year over year. We also publish eight additional reports on different verticals each year. Before I came on board to handle outreach, we had no repeatable strategy for getting coverage. We released a blog post about the research and promoted it in our newsletter and across social media as we do with all of our posts. However, two years ago we decided to develop a coordinated effort to get more awareness and coverage for the research on the day we release it. 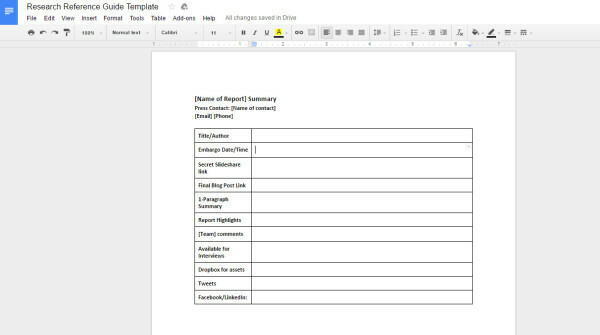 Here are a few of the strategies we use to spread the word about our research reports that you can customize. Even if you don’t create research reports, you can still use these strategies for other PR, including big announcements like product launches, etc. It is great that CMI’s research is cited all year long, but we want more buzz on the day we release our research. We want people writing and posting about the research that day – increasing the probability that more people will see it – beyond the regular CMI blog readers. But with something like a detailed research report, people need a few days to dive into it, process it, and come up with their own analysis or story idea. If they don’t see the research until the public-release day, the chance of journalists writing about it goes way down because if they take time to analyze the research, it becomes an “old” story. They would much rather write a thoughtful and timely piece that is ready to go the day we release the research publicly. That’s why we started offering an early sneak peek to influencers, journalists, and friends of CMI. 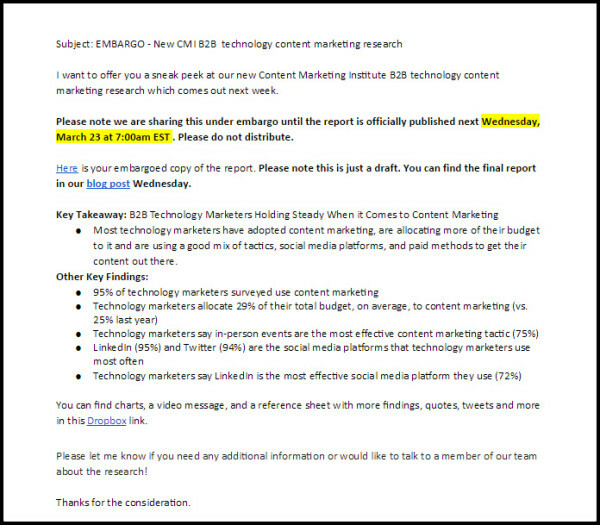 Not only does it help increase the probability they’ll have a blog post or story ready to launch the day the report is released, it’s also a nice gesture to offer our influencer and blogger friends who are regular supporters of CMI. Our research comes out on Wednesdays. We send out embargoed copies of the research the previous Friday. The final, polished versions of our reports may have last-minute corrections, so we clearly mark each preview copy with a draft stamp. This also cuts down on the chance that someone will publish or leak the findings early. Once we have this draft report ready to go, we then upload it as a “secret” SlideShare presentation, which is a private presentation that only those with a direct link can view. This secret link is what I share with the people on our lists. The goal is to make life as easy as possible for bloggers or journalists to increase the chance they will write about you. Click the image below to download your own copy, which you can customize to your team’s specific needs (go to “File > Download As >” and select the format you would like). For each research report, we put together a targeted Google spreadsheet of influencers who might be interested in the report. We pull the names from our substantial network of CMI bloggers, Content Marketing World speakers, Content Marketing Award judges, and influencers who are friends of CMI. For each report, we narrow the distribution to the people on the master list who are more likely to be interested in that report’s topic. For instance, we send the manufacturing report to influencers who handle marketing in manufacturing. While there may be some overlap between each report’s recipients, we don’t send the B2B report to someone who focuses more on B2C and vice versa. We also review these niche lists each year and update or add to them as needed. Here is a template you can download and customize to get you started as you compile your own influencer lists. Go to “File > Download As >” and select the format you would like). List all the publications that cover your industry. Check out their websites to find a list of the editorial staff or look at the masthead. Find the reporters’ email addresses, which can be tricky. Some sites list them, but other times you need to do more research or make a guess. Email addresses are sometimes included in profiles on Twitter and LinkedIn. As a last resort, I send an email to the generic “info” email. In these cases, I may choose to send a tweet to the reporter or publication to see if they are interested or to get their attention. This process should result in a good list of reporters, but the contacts are constantly changing. Before I start the outreach for any new report, I go through the list and make sure the reporters still work there. One of the easiest ways to do this is through Twitter. People usually list their most up-to-date job title in their profile. I find this easier than going through each website individually, especially because many mastheads aren’t updated regularly. NOTE: We do not buy access to media lists. If that is something you can afford, buying access to lists can be a good option. One caution: You still need to validate and vet the names and contact information on those lists. I’m not sure how often each service updates their contact lists, but before you send an email to someone on that list – you should check it out. Once I have assembled my report assets, and built and reviewed my influencer and media lists, it’s time to start the outreach. Here is an example email, but please note that I’m constantly tweaking it based on feedback or what I think is working well or not working. Three or four key takeaways that explain why we think reporters or influencers should write about the report. 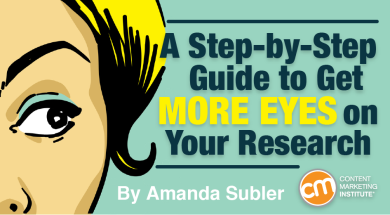 (Rather than just saying, “Here’s our research, enjoy,” it’s helpful to offer perspective and relevance. As for the reference guide, I’ve been experimenting with this process. I have attached the Word document to the email. Lately, I’ve included it in that special Dropbox folder for each report, and let the recipients know they can find it there. Our research is constantly cited throughout the year and creating that initial buzz to help spread the word has been very important for us. As we’ve executed and grown our outreach, we’ve seen media mentions of our B2B research grow 40% in the first eight months after release (from 360 in 2015 to 530 in 2016). As I mentioned, you can use the same basic process for other PR pitches, just tailor it for your company and the journalists or bloggers you are targeting. I’m always learning, and always tweaking this process. Do you do similar outreach for a PR campaign? What works for you? What have you learned?